The Malaysian Government Ministries endorse GULL’s work in Asia, January 2008. Where is GULL Asia based? GULL Asia is based near Kuala Lumpur, Malaysia. The GULL Malaysia campus is a large, spacious building in Pajam. 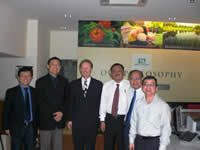 GULL Asia’s corporate office is located close to Kuala Lumpur city centre in Taman Desa Petaling. What is GULL Asia planning? GULL Asia is currently planning start-ups in: China, Indonesia, Malaysia, Taiwan and Vietnam. “I appreciate and congratulate your efforts in implementing the GULL internship programme in collaboration with local private institutions of higher education. How will learners make a difference? GULL Asia is providing a coaching programme for the management team of the Training & Career Development Division, Ministry of Higher Education, Malaysia. This will enable learners to work more closely in teams. Pictured: Ramli Khamis (left) and Richard Teare (right) with Zainab Bt. Ahmad, Principal Assistant Director, Training & Career Development Division, Department of Polytechnic and Community College Education, Ministry of Higher Education Malaysia. “I would like to take this opportunity to congratulate GULL for introducing the concept of an in-house corporate school. 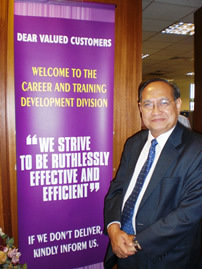 Ramli Khamis visits the Training & Career Development Division, Department of Polytechnic and Community College Education, Ministry of Higher Education Malaysia. 1. Where is GULL Asia Based? 2. What is GULL Asia Planning? The Malaysian Government Ministries of Higher Education, Human Resources and Youth & Sports endorse GULL’s work in Asia.